It is an Indo – Pakistan war in 1947 – 1948. Location of the war was in Kashmir. The code name Operation Polo was given by Indian armed forces. The location of this war was Hyderabad. By winning this war Indian army forces were getting success in ended the rule of the Nizam. The code name Operation Vijay was given by Indian armed forces. The location of this war was Goa. This operation made our India free from Portugal. It is also known as The Sino – Indian Border Conflict. This war was held between India & China. The location of this war was South Asia. This war was held between India & Pakistan. This war was held between India & Pakistan. This war was for Siachen glacier which is in Kashmir. The code name Operation Blue Star was given by Indian armed forces.The location of this war was Harminder Sahib in Amritsar, Punjab. This war was for removing the leader Jarnail Singh Bhindrawala. The code name Operation Woodrose was given by Indian armed forces.This operation was carried out by Prime Minister Indira Gandhi, just after a month of “Blue Star” happened. The code name Operation Meghdoot was given by Indian armed forces. After this Indian Army Force got to hold all of the Siachen glaciers and also all of its tributary glaciers. 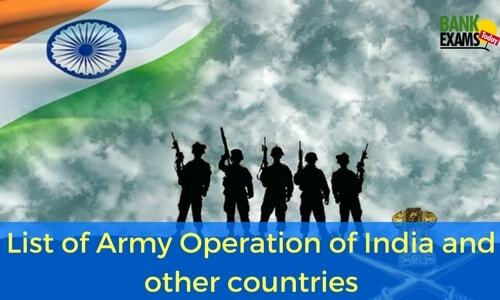 The code name Operation Rajiv was given by Indian armed forces. The location of this war was Siachen Glacier. This war was held between India & Pakistan. India got the victory in this war. The code name Operation Pawan was given by (IPKF) The Indian Peace Keeping Force. The location of this war was Sri Lanka. India got the victory in this war. The code name Operation Viraat was given by (IPKF) The Indian Peace Keeping Force. The location of this war was Shri Lanka. IPKF launched two operations in 1988. These were launched against (LTTE) Liberation Tigers of Tamil Eelam. The code name Operation Trishul was given by (IPKF) The Indian Peace Keeping Force. The location of this war was Shri Lanka. IPKF launched two operations in 1988. The code name Operation Checkmate was given by (IPKF) The Indian Peace Keeping Force. This operation was launched by (IPKF) The Indian Peace Keeping Force against (LTTE) Liberation Tigers of Tamil Eelam. Its motive was to boycott the (LTTE) Liberation Tigers of Tamil Eelam. This war ended in a victory of (IPKF) The Indian Peace Keeping Force. The code name Operation Cactus was given by The IMF. The location of this war was Indian Ocean (Maldives). When coup’d Etat was failed to the intervention of Indian Army. Then IMF gave the code name as Cactus operation. The code name Operation Vijay was given by (IPKF) The Indian Peace Keeping Force. This war was held between India & Pakistan. The location of this war was Kargil, Jammu - Kashmir. India got possession on Kargil after this war. The code name Operation Parakram was given by (IPKF) The Indian Peace Keeping Force. The location of this war was Kashmir. This war was held between India & Pakistan. As a result of this war was actually retreating between both countries. The code name Operation Black Torrado was given by (IPKF) The Indian Peace Keeping Force. The location of this war was Mumbai. It was a Bombay attack by 10 members of Lashkar-e-Taiba. Lakshar – e- Taiba was the militant organization of Pakistan. The code name Operation Surya Hope was given by Indian Armed Force. This operation was held for helping the people of Uttrakhand from the effect of North India Floods. It was launched by the chief of army staff General Dalbir Singh Suhag to eliminate Bodo Militants. This operation was launched by Indian Army force.the motive of this operation was to relief Nepal from Nepal government. The location of this war was Myanmar border. This war was the biggest attack on India after Kargil war.